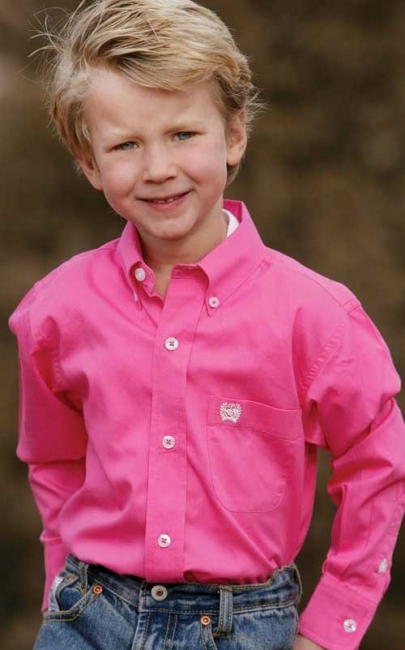 Young cowboys will stand out in the show ring with this bright pink solid twill western shirt. Cinch's pinpoint shirts are a timeless classic that are ideal for showing, riding, dress and casual wear. This boy's button down features a pearl button front and embroidered white Cinch logo on the single chest pocket. Just like dad's Cinch shirts! This shirt is also available for Men, Ladies and Girls so you can coordinate the entire family or a full team!